This week, I have considered the case of budget airline Ryanair. How is it that this once much maligned brand has managed to post a leap in profits of 66% to £623million, accompanied by a rise in share price of 5.4%? The answer one suspects, is in a concerted change of approach. Put simply, the Ryanair have tried to be friendlier, softer, more helpful and less stringent. Essentially, a more caring strategy has been the edict. In reality, this has been achieved by the implementation of several measures. Allowing flyers to bring a second bag on board, less castigatory punishments for slight rule breaches and a far simpler booking process are all example of the approach. What’s more, a marketing campaign with greater sophistication and a clearer message has been launched, helping the brand look more professional in the eyes of potential customers. YouGov BrandIndex data underlines the improvements that have been made, and the effect that the good financial news is having on consumer perception. Their Buzz Rating metric has risen since the results were released, and by 5 percentage points since March. More generally, their score has increased by 9% in the last year, highest among any airline company. Ryanair has always positioned itself as the low-cost airline of course. But our data suggests that increased numbers of people believe that the service offers value for money. The score the company has achieved in the last two weeks is the highest it has shown all year. 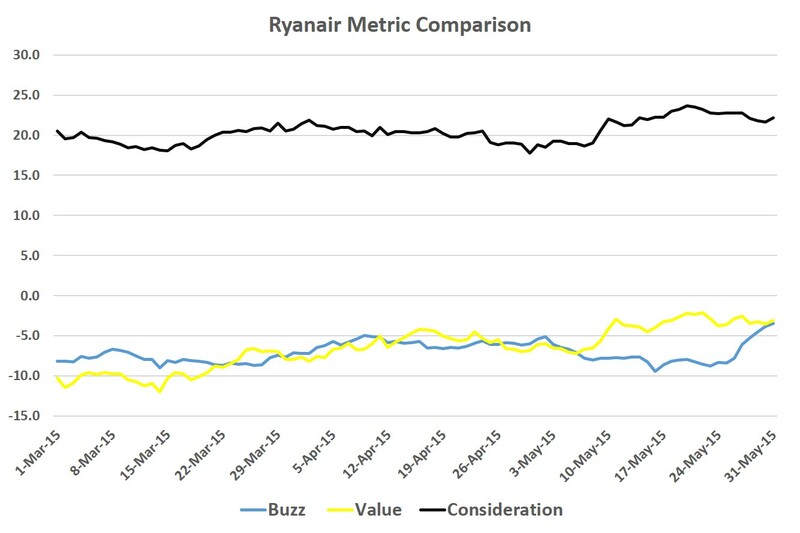 Naturally, Ryanair wants this improved perception to lead to higher numbers on its flights. Our Consideration Metric indicates that this is becoming a reality. Over the last month, this rating has been at its highest level so far this year. There is always room for improvement. Customers still do not like having to pay to print out boarding passes for example, and hidden costs are one of the accusations Ryanair has to field. The overriding sense however, is of a brand at the start of successfully changing its image, and matching it with eye catching financial results.